I think I would have enjoyed this collection of comics about how weird the world is, if only there hadn’t been so much profanity and excessive use of the word “pimp.” Some of the punchlines are crass, and I prefer clean humor. Some of the comics are wholesome and good, but a significant amount are not. I liked the simple art style, and the clarity of each panel. 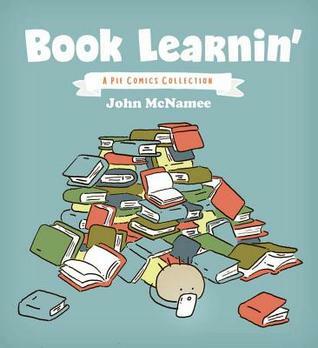 I’m not sure why this collection is entitled “Book Learnin'”. I thought it was comics about books, with reading as the main subject material for the jokes, but it’s not. There isn’t a single joke about reading or books. Disclaimer: I received an ecopy of this book from the publishers via NetGalley in exchange for a free and honest review. All the opinions stated here are my own true thoughts and are not influenced by anyone.